I love it when someone takes an old business model, shakes it up, and creates something pretty fantastic for the buying public. Sydney eyewear company Bailey Nelson has done just that with their super-affordable optical glasses and sunglasses designed in Australia. By taking away huge overheads, creating their own brand (rather than relying on an established designer name) and focusing on good lenses, Bailey Nelson can offer gorgeous frames for only $95 - brilliant! These are design-savvy frames for those who are more interested in style and affordability than labels. Hey, that's me! I would love any one of the women's glasses on the site. Have a look and let me know what you think. 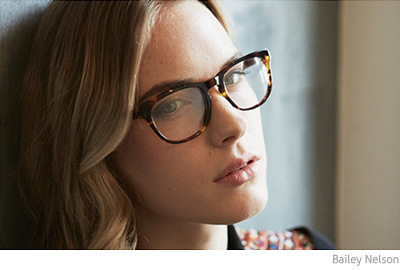 You can find Bailey Nelson frames in the online store or the Sydney and Melbourne boutiques. That's so fantastic. Also love that they let you try a few pairs at home before you buy.